More than half of the world’s population is currently using the internet, and this proportion is expected to increase to 70% by 2023. At the same time, cybercriminality is increasing. This clearly shows the importance of enhancing cybersecurity for individuals as well as for authorities and economic players. The Global Cybersecurity Index (GCI) is a composite index produced, analysed and published by the International Telecommunication Union (ITU) to measure the commitment of ITU Member States to cybersecurity in order to raise cybersecurity awareness. It reflects five pillars: legal, technical, organisational, capacity building, and cooperation. The index combines 25 indicators into one benchmark measure to monitor the cybersecurity commitment of 194 ITU member states. Europe dominates the global ranking with six countries among the top 10. 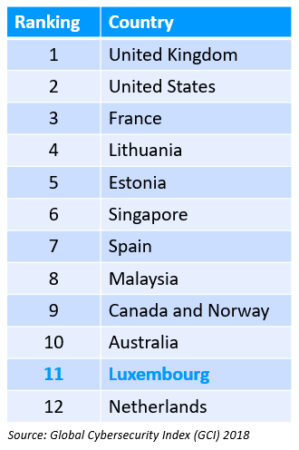 Luxembourg is on an honourable 11th place. The study highlights the country’s national cybersecurity strategies, its Cyber Security Board and its Cybersecurity Competence Centre. It also puts forward Luxembourg’s Cyber Emergency Response Communities (CERTs) that support security professionals and the tools developed that are available for everyone in open source format, including an exchange platform for threats, a risk analysis platform and a tool that can be used to assess the maturity of businesses in terms of cybersecurity and advise on relevant measures to implement. Awareness campaigns for the general public are also launched every year. Cybersecurity-related research is also a national priority. The GCI particularly mentions the Interdisciplinary Centre for Security, Reliability and Trust (SnT) of the University of Luxembourg, where 250 researchers specialise in this field.